Discussion in 'Guild Wars 2' started by Acina, Nov 20, 2010. "The great thing about minions is that they never last long enough to work up a horrid stench." Wells - Wells are persistent spells that allow a necromancer to control the area around him. Created at the necromancer's location, wells affect targets within the skill's range. Well of Blood, for example, applies a regeneration boon to all allies within it. A necromancer can only have one well skill active at any time. Minions - The necromancer summons undead minions to attack foes and do his bidding. Every minion-summoning spell has an associated secondary spell that appears after the minion has been summoned. This secondary spell destroys the minion while providing a powerful effect to the necromancer. For example, necromancers have a healing skill called Summon Blood Fiend that creates a minion that heals its master while it attacks. After the minion has been summoned, the Summon Blood Fiend skill is replaced by the skill Taste of Death, which allows a necromancer to destroy the minion to gain a larger amount of health. Marks - Necromancers can also place marks--ground-targeted spells with a variety of potent effects. For instance, Mark of Blood damages enemies while placing a regeneration boon on nearby allies. Marks will trigger after a set period of time, but a necromancer can always trigger their marks on command by hitting the skill again. Fear - Necromancers use a condition not available to any other profession: fear. A removable condition, fear makes an enemy flee directly away from a necromancer for a short period of time. 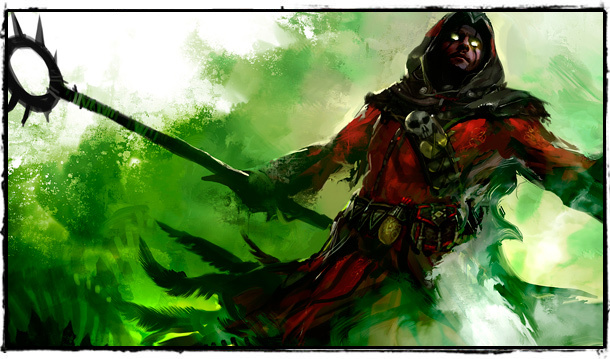 For example, a necromancer can use Doom to instill fear in a single target.